The Iranian people are naturally kind, hospitable and generous. Despite any preconceptions built up by the Western media, Iran is a very safe country to visit. Tourism is a well-accepted and welcome industry in Iran and, provided you stick to the local customs and show respect when visiting holy places, you will be made to feel very welcome and experience the well known Iranian hospitality. Although more and more travelers are visiting Iran each year, foreigners are still a novelty: you’ll find that the Iranians are surprisingly interested in you. No cause for alarm – it’s only because they genuinely want to talk to you, or practice their English with you. As long as you have an open mind and a willingness to be flexible, we are sure you will have a wonderful time! The group departures are either based on half board (breakfast and dinner) or bed and breakfast only. Please check tour inclusions for the various trips we offer. Where do we stay in Iran? Experienced travelers will acknowledge that the standard of hotels in Iran is not the same as in Europe or the US. However, all the hotels we use have been carefully selected and are clean, safe and reliable. We use a variety of hotels ranging from five star in the main cities, to clean, comfortable guesthouses in smaller towns. You will stay in twin-bedded rooms, unless a single room supplement has been paid, with a bath or shower and toilet en-suite. We offer two different categories of accommodation. For example on our our ‘Magic of Persia’ Tour, we offer ‘best available’ (four or five star hotels – though by no means corresponding to European standards). Where possible they are recently refurbished small and charming boutique hotels. We take special care to choose the best selection available each night, ensuring they are comfortable with good modern bathrooms and centrally located. These can be stunning historic hotels, with a central courtyard with a dining area shaded with a canopy, with divans that ring the edge making it a perfect place to relax. For our Silk Road Tour, we aim for an ‘authentic’ Iranian experience, offering accommodation that is traditional, where possible. We opt for the best available hotels at the Iranian three star level (though by no means corresponding to European standards), to ensure our guests have a comfortable stay in traditionally decorated and simply furnished double or twin rooms. Where possible we also arrange an overnight stay in a nomad tent or a home stay. For the purposes of a group tour, around six to eight weeks. What are the major don’ts? Emphatically don’t take any alcohol into the country nor ask for any when you are there. Don’t forget to remove your shoes before entering mosques (and private houses). A visa is required for all non-Iranian citizens. Currently most European passport holders are able to travel independently in Iran and can usually obtain up to 30 days visa on arrival (this cannot be extended). However, UK, USA & Canadian passport holders are required to join a fully escorted tour and cannot travel independently. Magic Carpet Travel will arrange for the visa permits to be issued and the visa stamped in your passport. This process takes around eight weeks. We will require your passport for two of those weeks to have the visa stamped in. Please see our visa section for full details. When is the best time to go to Iran? You can visit Iran at any time of the year, but the best times to go are spring and autumn. South Western Iran is always hotter than Central Iran. North West Iran (Azarbaijan province) is about 10 – 15 C cooler than the rest of Iran.. Here are some average temperatures: December – March 10-15C, April 18-25C, May – June 25-30C, July – Sept. 30-45C, Oct. & Nov. 25 –30 C.
What do I wear in Iran? Men should wear short- or long-sleeved shirts and long trousers. Jeans are fine; shorts are not. Women in Iran dress modestly, covering up the shape of their body and their heads. However, Iranian women are very fashionable, wearing modern outfits and colors, and making the Iranian dress code look very glamorous. Essentially you can wear Western clothes, such as jeans and a T-shirt, as long as you wear a long, thin robe called a ‘monteau’ over the top to cover your shape and arms and a loose scarf around your head. Please note you are required to wear a headscarf at all times in public. Can I use a Credit Card or ATMs in Iran? We recommend you bring enough cash to cover you for your time in Iran, as ATM’s, foreign credit cards and Travellers Cheques are not accepted in Iran. Although some places will accept a Master Card (subject to an additional 5% charge). What currency should I take to Iran? The currency in Iran is Rials. You cannot obtain Rials outside of Iran so you will have to change your money on arrival at the airport. The most popular currencies are US$ or Euros, although £ sterling is fine too. If you want to obtain a good exchange rate, do take clean & new bills. You can ask your tour guide to change the money for you, or you can do so at a bank. How can I get Travel Insurance for Iran? If you have an annual worldwide Travel Insurance policy, please check with your underwriters, to ensure their cover includes Iran. A few useful words and phrases in Farsi? How are you? – Haleh shoma chetoreh? Which guide books for Iran do you recommend? Lonely Planet & Bradt Travel Guide book. Can I use my mobile phone in Iran? All hotels offer facilities for international calls either in the lobby or directly from your room. International call charges are very reasonable. You can buy a local SIM card, or use your own mobile. The coverage in Iran is excellent these days, and your service provider’s call rates aside, you should be able to use your own mobile at all times. The coverage can fade in some parts of Iran, due to the geography. Overall however, it is very reliable. Can I take my computer to Iran and how is internet access? There are currently no restrictions on taking your own laptop, IPad etc. to Iran. Wifi is widely available, certainly in internet cafes. Communication via email is surprisingly efficient. Iran is a fairly safe country to travel in as far as health issues are concerned. However the following vaccinations are recommended: Malaria prophylaxis, typhoid, tetanus and hepatitis A. Of course it depends what season you travel to Iran and to what region. Please check with your medical practitioner for full details. 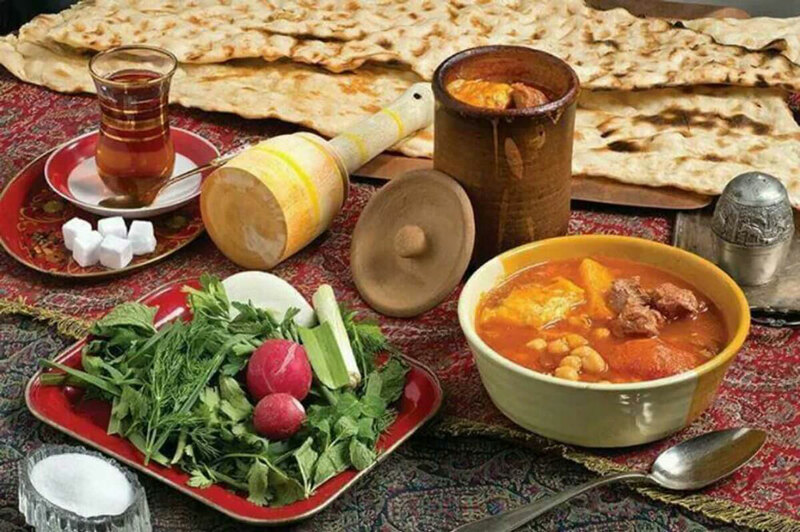 What is food and food hygiene like in Iran? Iranian food is superbly cooked fresh to order for you. The fresh fruit, herbs and vegetables are particularly delicious and much more flavorsome than our pale imitations. Although each province has its local specialty dishes a typical meal might include freshly baked bread, rice served with barbecued lamb or chicken, wonderful fresh yoghurt and bowls of crisp, sweet salad. Food in the hotels and up market restaurants is delicious and well cooked. However, we recommend that you exercise caution when buying food, especially fruit and salads, from street sellers or more basic restaurants. Just use your common sense and you will be fine. Many people have found that if they eat yoghurt with their meals, and this is nearly always available, that this helps keep their digestive system working efficiently. Please stick to bottled water which is widely available. If you are a coffee drinker, we suggest you take a jar along with you. How does tipping work in Iran? Tipping is the order of the day in Iran, so take lots of small notes and be generous! It is customary to tip the guides and drivers in Iran. If you are on a group tour, this is best dealt with by a joint kitty, Organized by a volunteer form the group. Here are some guide lines: you can tip the national guide $10 – $15 per day per person. The local guides around $2 $5 per day per person, and the drivers about the same. Iran is very safe country in which to travel and therefore children are very welcome. In fact, you will find that they will be the source of much curiosity and amusement. Nappies and basic medication are available in the large cities although you may wish to bring your own supplies for babies and young children. Girls under the age of nine years need not wear a headscarf. What about electricity plugs in Iran? The voltage is generally 220 V. Power sockets have two circular holes – exactly same as France. An international adapter is recommended. Is it safe to wonder around on my own? If you do occasionally want to wander around on your own, please inform either the guide when and where you are going. This will avoid the group waiting unnecessarily. You should expect and be prepared for changes and delays in any programme in Iran. What goodies to bring back from Iran? Because Iran is not so touristy yet, there are few tacky souvenir stalls. The best place to shop is the bazaar where you can buy authentic, locally produced goods. Here are a few things Iran is famous for.. dried fruit, nuts, specialty sweets such as sohan – butter, saffron, sugar, wheat sprouts, or gaz – Iranian nougat, and fantastic orange blossom, rose water or cardamom ice cream. Those interested in natural remedies, local spices such as saffron, and perfumed oils can have a field day. And don’t forget to buy the caviar and the pistachios. Carpets or Kilims are usually about half the price you’d pay in Europe or the US. Each person is allowed to leave Iran with one hand woven Persian carpet, up to 12 square meters. There is no duty or tax payable on this (even on entering the UK, as this is a handmade item). You can spend anything from $300 to $3000 on a 6’x 4’ carpet – it depends on your budget and taste. We will be happy to give you further detailed advice.